Toon's Tunes : Trace Adkins, Sunrise at Night, Citrus Heights, and the country journey continues. With a little Lee Child to help. Trace Adkins, Sunrise at Night, Citrus Heights, and the country journey continues. With a little Lee Child to help. Backtrack to a few weeks ago: if you haven't read the story of my Country Baptism, read it first. It's a part of this story. And then, you have to read the story about Reacher, Tom Cruise, and bedtime reading. Bear with me, it's all connected. staff are nice and friendly and helpful, it's easy to park and it's easy to get home afterwards. There is food and there is a bar and there are merch stalls and radio people and nice shiny-new cars presented by sponsors of the event. It's a fun way to spend an evening and to hear good music. 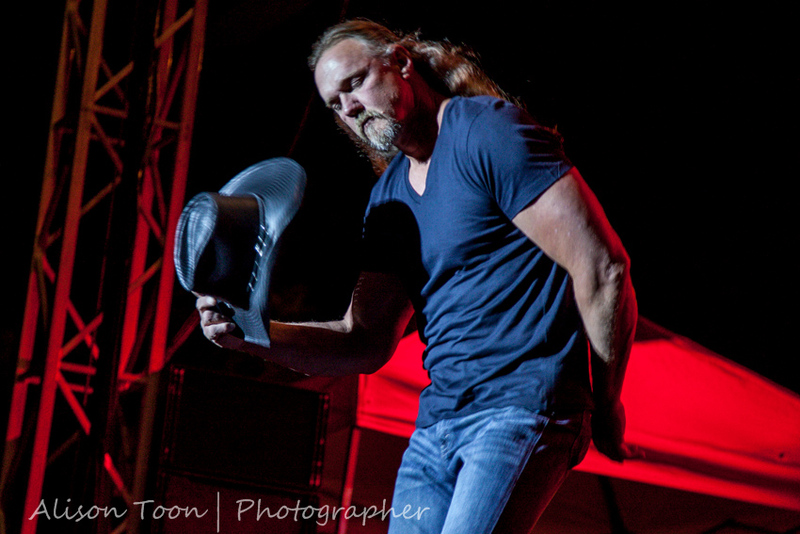 Trace Adkins is all man; he's tall, strong, powerful, cheeky. And he has a voice that roots down to your toes. The women shouted out when he hit the bass notes. I've been listening to Trace's new album, "Love Will..." for a few weeks. I prefer the ballads to the what-I-expect-of-Country songs. But... the more I listen, the more I find it's all ballads... some naughty, some fun, some very deep and tender. And oh, that deep deep voice. I'm covering all the Sunrise at Night shows, and Trace's has been my favourite so far. He'll take some bettering. He has big boots to fill. Cowboy boots. Am I a country girl now? I don't think so. Not quite yet. The supporting act, another country band, didn't do anything for me at all. I think it's the same as I always say: it doesn't matter what the music is labelled: what matters is, is it good? Can they play, can they sing? Can the artist move you with his/her music? Does it resonate somewhere inside? Does it have meaning, does it make you dance, does it make you cry? Trace Adkins: without a doubt, yes. Oh. And yes, without a doubt, he could play Reacher. Without even trying.